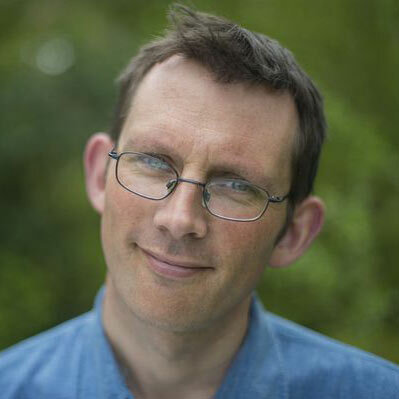 Rob Hopkins is one of the UK’s most influential environmentalists. He is co-founder of Transition Network and Transition Town Totnes, and a founder of the Transition movement, once described by the BBC as “the biggest urban brainwave of the century”. In 2005, Rob moved to Devon and set up Transition Town Totnes – which he describes as a ‘make it up as we go along community-led effort’. Transition Town Totnes is now at the heart of the Totnes economy, creating new jobs, encouraging new enterprises and helping existing local businesses thrive. It has kicked off more than 40 local projects, ranging from bike mending and grafting trees to a community energy company with 500 members. Inspired by the example of Totnes, community projects started popping up around the world. So, in 2007, Rob formed the Transition Network to support, encourage, network and train the burgeoning number of Transition initiatives. There are now more than 1,000 Transition Initiatives in nearly 50 countries, with projects ranging from community currencies to urban agriculture. Rob has been a permaculture teacher for many years, teaching food growing, natural building and permaculture design. He is an influential blogger, Tweeter and writer, author of The Transition Handbook (2008), The Transition Companion (2011) and The Power of Just Doing Stuff (2013). Rob was winner of the 2008 Schumacher Award, is an Ashoka Fellow and a Fellow of the Post Carbon Institute. He was the winner of the 2009 Observer Ethical Award for Grassroots Campaigner and was voted the Guardian’s ‘Green Community Hero’. In 2012, Rob was named by the Independent as one of the UK’s top 100 environmentalists and Transition Network won the European Economic & Social Committee (EESC) Civic Society Prize. Rob has a first class honours degree in Environmental Quality and Resource Management. He holds a PhD from the University of Plymouth, where he is also a Visiting Fellow, and was recently awarded an Honorary Doctorate by the University of the West of England. Rob is married with four sons and lives in Totnes, where he is also one of the founders of the social enterprise New Lion Brewery and a Director of Atmos Totnes, a very ambitious community-led development project. He is a keen gardener and prides himself on his fine beetroot. He enjoys drawing and is passionate about music.